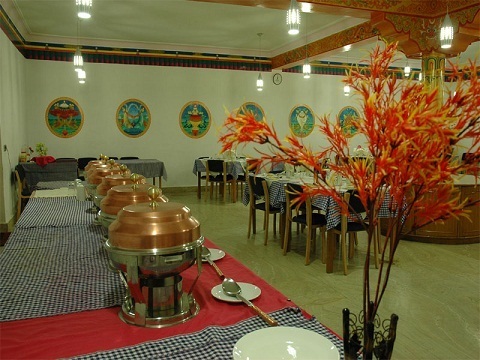 Hotel Namgyal Palace is a budget property located at 4.6 km from Leh Kushok Bakula Rimpochey Airport and 1.8 km from Bus Stand JK SRTC. The rooms of the hotel are aesthetically designed, centrally heated and well maintained. Essential amenities like television, spacious bathroom with essential toile tries, spring mattresses, easy chairs and mini-refrigerator are provided in all rooms. A host of essential facilities, such as breakfast, laundry service, dining area, and parking area are provided in the hotel to ensure a comfortable stay of guests. Family/Child Friendly, Front Desk, Parking, Taxi Service, Laundry Facilities, Airport Transportation, Travel Counter, Room Service, Backup Generator, Major Credit Card Accepted. Telephone, Complimentary Newspaper, Cable/Satellite TV, Desk, Luggage Rack, Air Conditioning Room, Television Room, H/C Water, Attached Bathroom, Dustbins. User reviews for "Namgyal Palace Hotel Leh"